Motivational interviewing is a collaborative, person-centered, goal-oriented method of communication with particular attention given to assessing and strengthening an individual’s motivation to take action. This is a powerful tool that can improve patient engagement, resolve patient ambivalence, and promote patient activation in setting and achieving goals, ultimately improving their outcomes. Motivational interviewing increases patient autonomy when trained clinicians use the techniques to explore patient values, helping patients identify and overcome their reluctance to discuss their goals of care. Once a patient’s goals are clarified they are then able to verbalize the action steps they will take to achieve their goals. Click HERE to sign up for the brochure on this online, self-paced course. As our healthcare system transitions from traditional fee for service to value-based care, patient outcomes will drive both referrals to palliative and payment for the services you provide. While there is a growing body of research that demonstrates palliative care improves patient outcomes and reduces costs of care, patient and family caregiver involvement in the palliative care planning process significantly impacts both care outcomes and cost. Motivational interviewing is a powerful tool to make YOU more effective at helping patients and families with both planning and achieving their goals. In addition to goal setting, motivational interviewing also helps professionals navigate the challenge of supporting patient autonomy when they disagree with patient choices. People will achieve the goals they are motivated to achieve. Motivational interviewing helps clinicians discover an individual’s ambivalence and resistance to palliative care by eliciting from clients their reasons for ambivalence and resistance and supporting readiness to change. 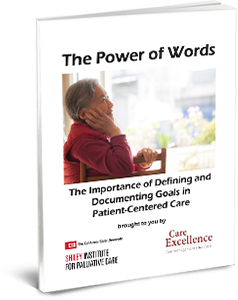 In palliative care motivational interviewing is focused on helping patients identify behaviors and actions that support their ability to achieve the goals they establish for themselves. 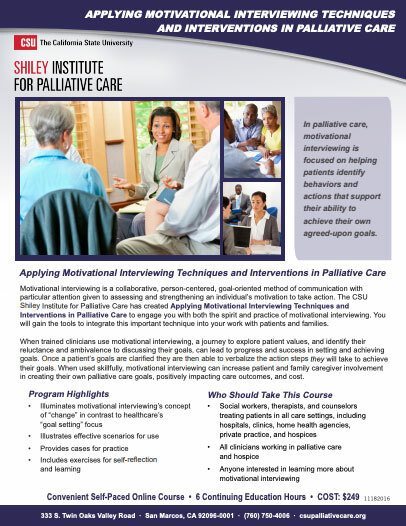 This course explores the spirit of motivational interviewing, teaching palliative care professionals ways to integrate motivational interviewing into their work with patients. Summarize the theoretical framework that guides the use of motivational interviewing as one approach to creating person-centered plans. Discuss limitations of motivational interviewing. Identify research outcomes that support motivational interviewing best practices. Define what is meant by the “spirit” of motivational interviewing. Contrast the motivational interviewing concept of “change” with the healthcare “goal setting” focus. Discuss the use of decisional balance for fine tuning plans. Demonstrate the application of specific techniques and interventions in case-based situations that lead to assessing motivation. Gary Gardia, MEd, MSW, LCSW has more than 30 years of experience as a hospice and palliative care social work leader and consultant. He served in leadership positions with National Hospice and Palliative Care Organization (NHPCO) including as the national section leader for Social Work and was instrumental in the creation of their Manager Development Program. Gary has written and published extensively and is a frequent presenter and keynote speaker at state and national conferences. Gary has also worked as a psychotherapist in private practice with a specialty in grief and loss, personal growth and development and substance abuse. Elizabeth (Liz) Barnett, MSW, PhD has over ten years of experience helping professionals apply motivational interviewing (MI) in their work settings. She is an active member of the Motivational Interviewing Network of Trainers (MINT) since 2005 and the co-founder of Motivational Interviewing for Change (www.miforchange.com). She has trained social workers, nurse case managers, probation officers, group home staff, service coordinators and school counselors. She has also published peer reviewed journal articles and book chapters on the use of MI, and developed MI demonstration videos in a variety of settings. She is passionate about the quality of services being delivered to those in-need and feels strongly that quality services begin with excellent communication skills.